Home Everyday What’s in a New Pierce Transit Bus? What’s in a New Pierce Transit Bus? 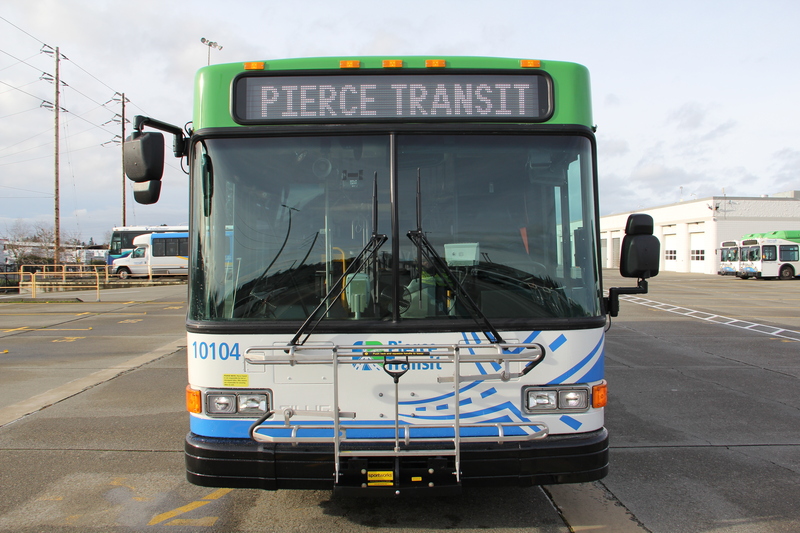 Many people in the South Sound rely on Pierce Transit for everyday transportation. This year, riders can expect to see a number of new buses taking to the streets as the organization retires aging vehicles and taps federal grants to purchase new buses that will see far fewer hours in the maintenance bay and many more hours carrying passengers. In 2017, Pierce Transit made the decision to purchase 23 new buses, and in 2018 the company purchased 20 more. During the economic recession Pierce Transit delayed many capital projects and purchases, choosing instead to focus its efforts and funding on providing service on the street. That left the agency with a backlog of aging infrastructure, from transit centers, to technology systems and vehicles. Now Pierce Transit is catching up and reinvesting in important long-awaited capital needs. Over the past year the agency has conducted repairs and renovations to five local transit centers and Park & Rides, with the goal of protecting the public’s investment in them and bringing them up to the standard Pierce County deserves. Now Pierce Transit has turned its attention to its vehicles, with a focus on retiring older vehicles that are well beyond their useful lives and tend to break down more often. 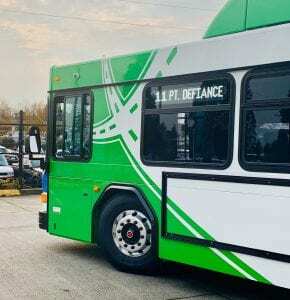 Keeping their customers in mind, Pierce Transit believed it was important to invest in new buses that will experience fewer breakdowns and focus on conducting more affordable preventative maintenance on newer vehicles rather than expensive emergency repairs. Pierce Transit’s new buses are making their way into commission. Twelve out of the 43 newly purchased vehicles are actively running throughout the South Sound, and the company plans for the rest to arrive over the course of the year. Once each new bus is delivered, it takes about two and a half months to get them street-ready. 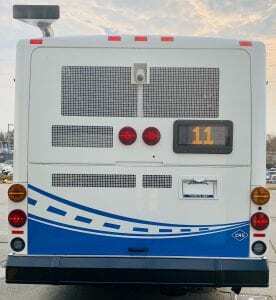 Each bus is outfitted with a system of innovative electronic gear, which includes communication technology, bus monitoring software and cameras. One of the newest electronic tools is Zonar, a system that will help Pierce Transit bus drivers use technology to inspect a bus before and after each trip. The system will automatically sort and send task lists to maintenance staff, so they can more quickly and efficiently conduct needed repairs or other work. Buses will also be equipped with new DriveCams, which are installed not only on buses, but all agency vehicles, including paratransit buses and administrative vans and cars. DriveCam features a forward- and backward-facing camera, which provide a view of both the driver and out the front window of the vehicle. If a driver follows too closely to another car or has to brake hard, the camera trips off a 12-second video recording what happened. The video is used to help mentor drivers and encourage safe behavior in all agency employees. Drive Cam was introduced to Pierce Transit vehicles in September 2018. Since using the camera monitoring system about six months ago, the agency has seen a significant decrease in accidents. In addition to buses, Pierce Transit is adding a modern vehicle monitoring system called MSlate to its paratransit vehicles, allowing for better and easier communication between the dispatch team and drivers. Routes will be delivered to the driver through cellular data, while thoroughly tracking and assisting drivers so they can be sent where they’re needed. Not only will Pierce Transit’s new buses be running smoother than ever before, but they’ll also have a fresh new look about them. Sporting a sharp design with Pierce Transit’s fresh new logo, passengers can look forward to riding in style. Pierce Transit’s in-house staff updated the old logo, which had been in use since the 1980s. The company wanted to give their new vehicles a refreshed image all while being as fiscally responsible as possible. Rather than spending time and money to rebrand their current fleet of buses, each new bus will be customized with its new look upon arrival. While the new fleet starts to roll out, it won’t only be buses getting upgraded. Pierce Transit plans to add 10 new SHUTTLE paratransit vehicles, 28 new Vanpool vans, as well as 17 non-revenue vehicles to their fleet. With of all of these new vehicles, the company is looking forward to getting their focus back to where it belongs – on preventing breakdowns and performing preventative maintenance on the new vehicles to ensure a long and healthy lifespan. For more information about Pierce Transit and transit news, visit its website to learn more.